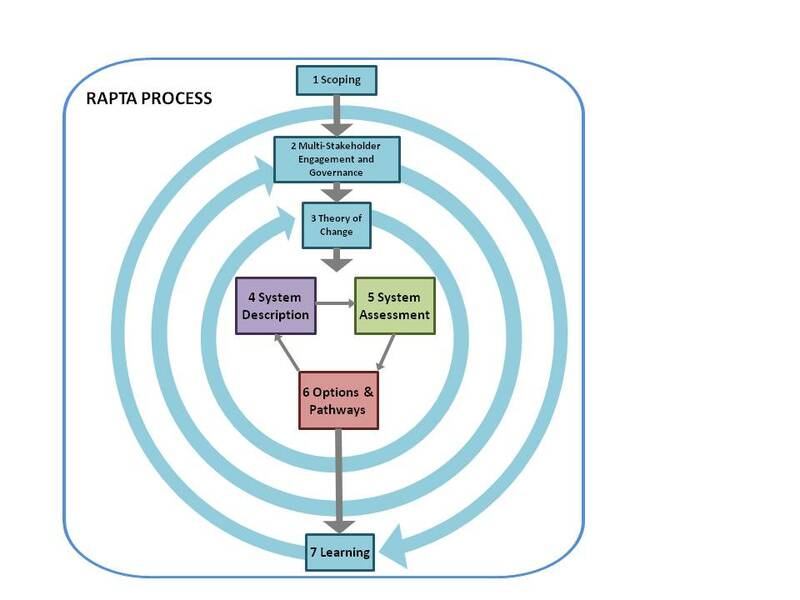 The RAPTA (Resilience, Adaptation Pathways and Transformation Assessment) framework offers practical guidance in how to apply these concepts in planning projects so they are better designed to deliver valuable, durable outcomes in the face of high uncertainty and rapid change. RAPTA will help project and program developers to apply these concepts across a wide range of project types. The core features of the RAPTA include identification of system drivers and shocks, the main resources and their uses, valued components and products of the system, controlling variables of these valued components and products and description of any threshold effects they may exhibit, cross-scale interactions and feedback loops. Detailed resilience assessment includes identifying risks or points-of-no-return, opportunities for adaptation and/or transformation, and the costs and benefits of these options. It does this iteratively, as understanding and competence grow. It builds in learning at every stage and uses the increasing understanding to refine the project plans and develop the ability of stakeholders to manage them to successful implementation, no matter what else arises. RAPTA has wide application to plans for improving food and water security, managing climate change, attaining sustainable growth in the Earth’s megacities, better responding to the accumulating risks that confront humanity and transforming (or protecting) the social and ecological systems which support us, for the better. All this is happening at a time of rapid change and growing uncertainty, as surging human needs and demands come up against the finite capacity of the Earth to meet them, a time when the best-laid plans may be undone by unforeseen developments. Overview of the RAPTA process detailed in the RAPTA Guidelines. Applying RAPTA is an iterative process. The components in blue are both discrete steps and ongoing processes. Though numbered for ease of reference, they can be applied in varying orders. They are a routine part of most development projects but are included here because they are critical to applying RAPTA successfully. Some may need to be modified to reflect RAPTA concepts. The heart of what is new in bringing RAPTA into project design is shown in the centre – System Description, System Assessment, and Options and Pathways. Scoping: a standard component of project development that summarises the purpose and nature of the project. These guidelines highlight the aspects of scoping that are unique to RAPTA. Applying RAPTA in the project identification stage involves a “light pass” through all seven process components, after which Scoping is revisited to confirm or revise the initial plan. Engagement and Governance: This component ensures the right people are involved in the right way, at the right time, both ethically and transparently. RAPTA emphasizes a shared understanding of the many perspectives on problems and their solutions. It establishes roles, responsibilities and accountabilities. Engagement and Governance is essential to all phases of the project cycle. Using RAPTA, it comes in early and is continually strengthened and modified as the project develops. Theory of Change: Existing theory of change methods can be complemented and enhanced by RAPTA by systematically considering resilience, adaptation, and transformation (e.g. there is a deliberate consideration of options for transformational versus incremental change). It emphasizes the testing of initial hypotheses, improvement through learning and responsive management. Theory of Change is a key activity in the project identification phase and early in the project design phase. It is also an important input into the implementation phase of a project and underpins monitoring and assessment, and project evaluation. System Description: Drawing from stakeholders’ diverse perspectives, as well as the literature, this component produces a record of the current understanding of what the system consists of and how it is connected, and the assumptions and evidence underpinning this understanding. It forms a fundamental base for assessing the system’s resilience, and underpins both the next two components. System Assessment: This component identifies potential risks, points of no return and key controlling influences (‘controlling variables’) associated with anticipated future shocks or changes, as well as opportunities for adaptation or transformation. It draws heavily on resilience concepts and tools that are central to the RAPTA. It occurs early in the project cycle and is often revised, through Learning. Options and Pathways (short for Intervention Options and Adaptive Implementation Pathways): Here, the intervention options are identified and arranged into a provisional order for implementation. Their qualitative and quantitative benefits and costs are estimated. This helps form an implementation plan which is closely linked to Learning and is actively updated and adaptively managed over time. Learning (short for Monitoring & Assessment, Lessons Learned and Knowledge Management): This is a flexible, iterative component. The engagement of project stakeholders (e.g. government policymakers, NGOs, community members) in Learning is essential to enable self-assessment, awareness of their roles and their capacity to influence future action. Effective learning requires a governance framework that supports monitoring and assessment and knowledge sharing.